The temple of Goddess Vaishno Devi is one of the major and sacred Hindu temples dedicated to Parvati or Goddess Shakti, the Divine Consort of Lord Shiva. This beautiful temple lies ensconced among the picturesque hills of Vaishno Devi, in the state of Jammu and Kashmir in India. 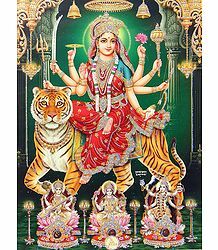 Hindus venerate Vaishno Devi, also commonly referred to as Mata Rani and Vaishnavi, is the very manifestation of the Mother Goddess Shakti. The Vaishno Devi Manir is located close to the town of Katra, in the Reasi district. It is one of the most revered places of worship in India. The shrine is situated at an altitude of 5300 feet above sea level and lies at a distance of approximately 12 kilometres from Katra. It has been recorded that close to 8 million yatris (pilgrims) visit the temple every year, from each and every part of the world. It is believed to be the second most visited religious shrine in India, coming after the Tirumala Venkateswara Temple. The temple premises are maintained by the Sri Mata Vaishno Devi Shrine Board. Pilgrims can access the temple by rail via Udhampur to Katra. The Jammu Airport is the best way to reach the shrine for those travelling by flight. According to legend, Mata Vaishno Devi was born in the Southern part of India, to Ratnakar Sagar. Her parents had been childless for several years and yearned to sire a child. Just the night before the birth of the Divine Child, Ratnakar had promised that he would never ever interfere with whatever his child chose to do later in life. 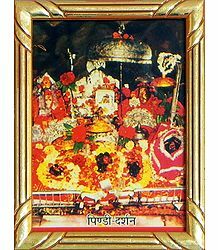 Mata Vaishno Devi was born the next day and was named Trikuta. She was later called Vaishnavi because she had taken birth from the lineage of Lord Vishnu. When she was 9 years old, Trikuta sought her father's permission for performing penance on the seashore. Trikuta sat there, praying to Lord Rama, an avatar of Lord Vishnu. At that very time, Lord Rama passed along the seashore, in search of Goddess Sita, who had been abducted by the Demon King, Ravana. 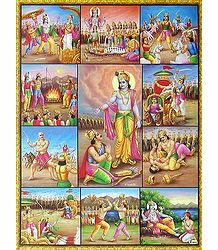 Rama was present with his entire Vanara Sena (Army of Monkeys). Seeing the beautiful girl with the divine glow, deep in prayer and meditation, he approached her and blessed her. Trikuta told Rama that she had already accepted him as her husband. Rama, being Eka Patni Vrata (vowed to have only one spouse), had decided that he would wed and be faithful only to Sita. However, moved by the girl's devotion towards him, the Lord gave her the name Vaishnavi and promised her that during Kaliyuga, he would take an avatar of Kalki and would then marry her. 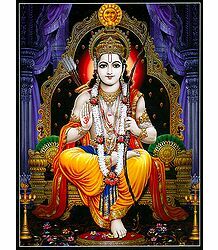 Rama, in the meantime, also instructed Trikuta to meditate in a particular cave found in the Trikuta Range of Manik Mountains, situated in Northern India. He proceeded to give her a bow and arrows, a small army of monkeys and also a lion for her protection. The Divine Mother then decided to observe the 'Navratra', to pray for the victory of Lord Rama against Ravana. Even today, devotees read the Ramayana during the 9 days of the Navratri festival. Rama also promised her that the entire world would sing her praises and revere her as Mata Vaishno Devi. It is due to Rama's blessings that Mata Vaishno Devi attained immortality and now attracts several hundreds of thousands of pilgrims to the shrine each year. 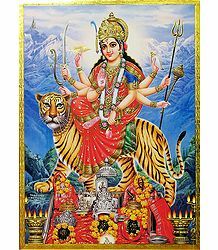 According to legend, at the time when the Mother Goddess was engaged in waging terrible wars against and destroying the Asuras or demons causing chaos in the world, Her three main manifestations, namely, Maha Kali, Maha Lakshmi and Maha Saraswati united into one single power, pooling in their collective spiritual strength. This unification created a bright tejas or aura and a beautiful young girl emerged from this tejas. The girl asked the Mother Goddesses for instructions to proceed ahead with her mission. The Devis told her that her mission was to manifest on Earth and spend her time there, upholding Dharma or righteousness. They asked the divine girl to take human birth in the home of Ratnakar and then go on to lead a life of piousness and penance, so as to raise her own consciousness to the level of Godhead. They also told her that once she had attained that level of consciousness, she would then automatically merge into and become one with Lord Vishnu. Accordingly, the girl took birth as a beautiful little girl child. She had an insatiable thirst for knowledge and displayed keen leanings towards spirituality and a quest for the knowledge of the inner self. She would go into deep meditation and stay in that state for hours together. She then decided to renounce all worldly comforts and travel deep into the forest to perform severe austerities and penance. This is when she met Lord Rama and attained his blessings. She wanted to become one with Rama, as was her mission. However, Rama, knowing that this was not the appropriate time, promised her that he would visit her again, after the end of his exile. He told her that if she recognized him at that time, he would then fulfill her wish. Rama kept his word and visited her after winning the battle against Ravana. He came to her in the guise of an old man, who Vaishnavi could not recognize. She was completely distraught when Rama revealed his true self. Rama laughed and told her that the time had yet not come for them to be with one another. He also assured her that they would unite during Kaliyug, asking her to set up her ashram in the foot of the Trikuta Hills and serve to uplift the poor and the destitute. With Rama's blessings, people came to know of Vaishnavi's glory and the word of her ashram spread far wide. Very soon, devotees and followers began to flock to her Ashram in order to get a darshan from her. A devotee of Vaishno Devi, Sridhar, organized a Bhandara (Community meal) in which the whole village and Mahayogi Guru GorakshNathJi along with all his followers were invited as per Vaishno Devi's wishes. Guru Gorakshnath visited this Bhandara along with more 300 disciples including the Bhairavnath. Bhairavnath was amazed by seeing the power of divine mother. He wanted to test her powers. For this, he asked Guru GorakshnathJi for his permission. Guru Gorakshnath told Bhairavnath that he did not recommend this but if he still wanted to test Vaishno Devi's powers, he could go ahead and do so. Bhairavnath then attempted to grab Vaishno Devi but she fought him back and then decided to flee the place. She ran away into the mountains in order to resume her penance. However, Bhairon Nath continued to chase her there as well. On the way to the mountains, Vaishnavi took several halts at Banganga, Charan Paduka and Adhkwari. She ultimately reached the cave where she intended to continue her tapasya. To her chagrin, Bhairon Nath followed her there as well. Finally, losing all patience, she decided to kill him to end his harassment. Coming out to the mouth of the cave, she beheaded him. Bhairon Nath lay dead at her feet, his severed head flying off with a force and falling at a distant hilltop. His soul, realizing his folly after his death, approached the Goddess and prayed to her to forgive him for his misdeeds. The benevolent Goddess immediately felt compassionate towards him and granted him a boon that each and every devotee visiting her shrine would then also have to take a darshan of Bhairon, in order to complete their pilgrimage. The Goddess then decided to shed her human form and take the form of a rock in order to continue uninterrupted with her meditation. Vaishnavi, hence, gives her devotees darshan in the form of a five and half feet tall rock, with three pindies or heads on the top. The cave where she transformed herself is now the holy shrine of Sri Mata Vaishno Devi and the pindies form the sanctum sanctorum. There are many other legends associated with Vaishno Devi. One of them relates that the Pandavas visited the holy cave and built a shrine there. After that, Prahlad, the son of the terrible Demon King, Hiranyakashipu, undertook a journey to the shrine. However, the most famous legend is that of a Brahmin, Shridhar, who lived in a village called Hansali, located at the foot of the Trikuta Parbat. This village lies adjacent to the present day town of Katra. Shridhar was a staunch devotee of the Goddess Shakti. He was very poor and could barely afford a square meal a day. However, he was happy and contented, in the knowledge that the Devi was forever there to guard him from any harm. The Goddess Vaishnavi appeared before him in a dream one night, taking the form of a young girl, or Kanya. Shridhar, overwhelmed by this darshan and utterly grateful to his ishta devata, decided to undertake a grand Bhandara ceremony in the village, also inviting people residing in all the nearby villages to participate in the event. From that day on, he started visiting the villagers' houses, requesting them to donate rice, vegetables and other provisions that would be necessary to conduct this Bhandara. While some people acceded to his request, most others turned him down. Some even taunted him for planning to hold a Bhandara, when he did could not even feed himself. As the day of the planned Bhandara drew closer, Shridhar started getting worried about how he was going to feed so many guests. Shridhar could not sleep a wink on the eve of the Bhandara. He kept thinking of ways and means to collect more food and provisions to feed his guests the next day, but could not arrive at any solution whatsoever. Finally, he just decided to surrender to the Goddess' will and face the next day as and when it came upon him. The next morning, Shridhar prepared for a pooja (prayer session) just outside his hut. His guests started streaming in by mid morning. Seeing him praying so intently, they decided not to disturb him and made themselves comfortable wherever they could find the place to sit. Strangely enough, they found that they could all be seated comfortably inside Shridhar's small hut. The hut was really small and the crowd grew larger and larger. Yet, there seemed to be enough space inside the hut to accommodate a lot more people. Having finished his pooja, Shridhar opened his eyes and saw the staggering number of guests who had arrived for the Bhandara. He was just starting to wonder how he would tell his guests that he would not be able to feed them, when he saw the Goddess Vaishnavi emerge out of his little hut. The Devi had seen to it that everyone got to eat the food of their choice and that they were all happy by the end of the meal. The Bhandara turned out a great success and his guests left his place, completely satisfied. After everyone finished their meal and left the site of the Bhandara, Shridhar tried to find an explanation for the mysterious events of that day. He also wanted to unravel the mystery that was Vaishnavi. He prayed, asking the Goddess to show herself to him, but she did not respond. He tried repeatedly calling her name, but she never turned up to give him darshan. Distraught and feeling empty from within, he gave up his attempts to find her. One night, Vaishnavi came to him in his dream and told him that she was Vaishno Devi, also showing him the location of her cave. An ecstatic Shridhar left in search of the cave. Each time he lost his way, the vision of the dream came back to him, pointing to him the exact direction of the same. He finally found his destination and was overawed by the sight of his favorite deity in front of him. One version of the tale narrates that all the three Mahadevis appeared before him and also introduced to him to the Three Pindies. The deity gave him the right to worship her idol, also asking him to spread the glory of her shrine. Further, she blessed him with a boon that he would have four sons. Pandit Shridhar then completely surrendered to her will and decided to spend the rest of his life in the worship of the Goddess. Word of this incident spread around and soon, devotees started flocking this holy cave to pay their obeisance to the powerful Goddess, Vaishno Devi. Followers of Mata Vaishno Devi believe that no one can visit her temple unless and until she issues a "bulawa" to them, that is, till she calls them to visit her shrine. Irrespective of caste, creed and social status, it is said that a journey to the sacred shrine of Vaishno Devi can materialize if and only if she wills it and blesses the devotee with her darshan. In fact, many devotees have been said to experience this first hand. The converse is also said to be true. If there is a Call from the Deity, even those who had not planned for the trip are bound to go visit the Mother at her shrine. Those desirous of visiting her shrine, therefore, make a fervent wish in their hearts and pray to her for showering her grace and granting darshan to them. Then, they surrender to her will and leave it to her to decide when it would be the right time for them to go visit her Holy Abode. There is no exact record as to when the shrine of Vaishno Devi came into existence. Certain geological studies seem to indicate that it may be nearly a million years old. Though the Vedas make no mention of Mata Vaishno Devi, the earliest reference to a mountain deity named Trikuta has been made in the Rigveda. It is worth noting here that the worship of Shakti and other female deities started only during the Puranic era. The Mahabharata makes a referece to the Mother Goddess. The epic states that just before the great War of Kurukshetra, Arjuna, on the advice of Shri Krishna, meditated upon the Goddess, seeking her blessings for victory. At this juncture, Arjuna describes the Devi as "Jambookatak Chityaishu Nityam Sannihilaye", meaning, "the one who permanently resides in the temple located on the slope of the mountain in Jamboo". Scholars say that he could well be referring to the Jammu of that time. The Pandavas are also believed to have built temples dedicated to the Mother Goddess, in regions close to the Trikuta Mountain. On a mountain adjacent to the Trikuta Mountain are five rock structures, overlooking the Holy Cave shrine of Mata Vaishno Devi. These five rocks are believed to symbolize the five Pandavas. Many schools of thought consider the Vaishno Devi shrine to be the holiest and most powerful of all the 51 Shaktipeethas. This is because they believe that the skull of Mata Sati fell in this area. Yet other followers believe that her right hand, which holds the Abhaya Hasta (the gesture of succour), had fallen there. Incidentally, one can find the remains of a human hand here. It is also referred to the Varada Hasta, granting protection, blessings and boons to true devotees. 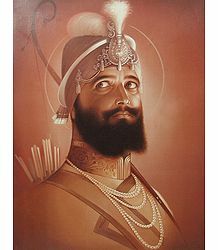 Guru Gobind Singh, it is recorded, visited the shrine of Mata Vaishno Devi, while he was travelling to Purmandal. This was the earliest record of a historical figure visiting the shrine of the Mother Goddess. Vaishno Devi is believed to bestow strength to the weak, sight to the blind, wealth to the poor and bless childless couples with children. This very powerful deity, it is said, is also benevolent enough to fulfill one and all of her devotees' wishes. This is why followers make it a point to visit her regularly, in spite of the shrine being quite unapproachable, location-wise. As predicted by Lord Rama, her shrine is packed with crowds of devotees all the year through. However, Navaratri is considered the most auspicious time to visit her abode. This is also the best season to visit the temple, as it tends to get too cold and inaccessible during winters and monsoons. Visiting Vaishno Devi during the Navaratras, it is believed, takes the devotee one step closer to attaining heaven. Today, there are various ways in which a devotee can reach the holy shrine of Vaishno Devi. The nearest railway station and airport are situated at Jammu. The shrine is linked to the Base Camp at Katra via a track that is 13 kilometers long. In order to undertake the uphill journey from Katra to Bhawan, one can either travel on foot; or by hiring ponies or palkhies (a type of palanquin). The Vaishno Devi Shrine Board has also commenced air taxi and helicopter services between Jammu, Katra and Sanjichat, in order to further facilitate devotees. These services, of course, are subject to weather conditions in that area. One can find several ancient temples and sightseeing points On the 13 kilometer stretch between Katra and Bhawan. The first one is Banganga, which is 1 kilometer away from Katra. 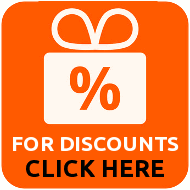 Here, one can take a holy dip in the rivulet and also avail fo the Langer (free food) service there. The Charanpaduka Temple is the second stop, about 2.5 kilometers away from Banganga. It is said that the Goddess rested a while here, before travelling to the Trikuta Hills. This place is so named, since it contains the foot prints of the deity. Adkuwari lies about 3 kilometers away from Charanpaduka. This point is halfway to the Vaishno Devi shrine. Devotees usually spend the night here, before proceeding onto the shrine. This place also houses the Adkuwari Temple and Gerbhjoon, an ancient cave, wherein the Devi is believed to have hidden for 9 months, in order to protect herself from Bhairon Nath. The next stop is Sanjichat, which is about 4 kilometers from Adkuwari. This is the highest point in the long-winding track, from where travelers can get a breathtaking aerial view of Katra, Udhampur, Reasi and Jammu. The last 2.5 kilometer stretch is a downhill journey, which leads to Bhawan, the sacred shrine of Shri Mata Vaishno Devi. After completing their darshan there, devotees must then proceed to the Bhairon Nath temple, which lies at a short distance on a link track of the main Bhawan-Sanjichat track. This track further leads to a dense forest area; inhabited by several monkeys, wild animals and birds. Apart from the above shrines, one can also visit the Brahma, Vishnu and Mahesh Dham, which is located quite close to the Mata Vaishno Devi shrine. This Dham is especially crowded with devotees during Kartik Poornima. On this particular evening, devotees perform a special Deep-Daan (donation of candles) ritual in front of Mata Vaishno Devi and Mata Annapoorna.